Last weekend I spent some time reflecting on last week’s DCD Enterprise Conference in New York City. Three main “end user” themes stood out as concerns when evaluating their data center strategies. Throughout the event, I heard speaking sessions and questions at our booth dealing with cost efficiencies, Data Center Infrastructure Management, and deployment times. Cost efficiency was a highlighted topic during panels, presentations and on the exhibit floor. I found our team consistently asked about the cost of Colocation vs. Modular, and which strategy really would get them the most bang for their buck. To be part of a colocation site is certainly an investment; just as fabricating your own modular data center. It has been shown over multiple deployments that the cost over time is not a significant difference. That said, it is important to consider what your specific company needs are, and strategize from there. Cost is usually the driving, bargaining and selling point for a customer; we must look beyond that dollar amount into sustainability, security and long term return. Data Center Infrastructure Management (DCIM) was a driving force this year at DCD Enterprise Conference. Developing, implementing and securing a fast and safe software solution linking all your utilities regardless of their age has become a critical requirement. At our booth, we could demo our infrastructure management solution, RunSmart™ Software and showcase how this tool can adapt to a wide variety of data center systems. This ability to connect to anything sparked many questions and interest in market/company potential. The third topic that emerged centered around data center deployment speed. History has shown that large scale designs, contracts, integration and development can take months or even years to complete. Attendees were interested in hearing how our data center deployments could be delivered within 120 days to address rapid provisioning. 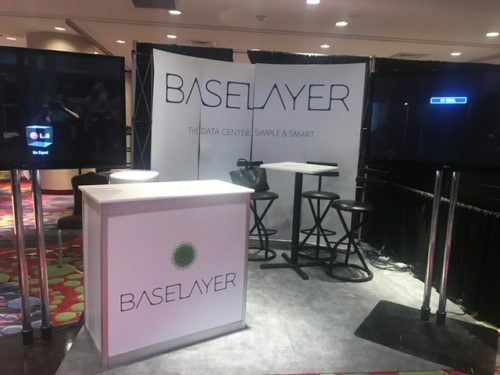 With BASELAYER’s approach to design and manufacturing for modular data centers, this is now a reality. As with most conferences, the amount of information to be learned can be overwhelming, and DCD Enterprise NY was no exception. Despite the weather challenges, the content was strong, and I took away several new perspectives on customers’ needs. What trends in the data center industry did you learn about while attending?